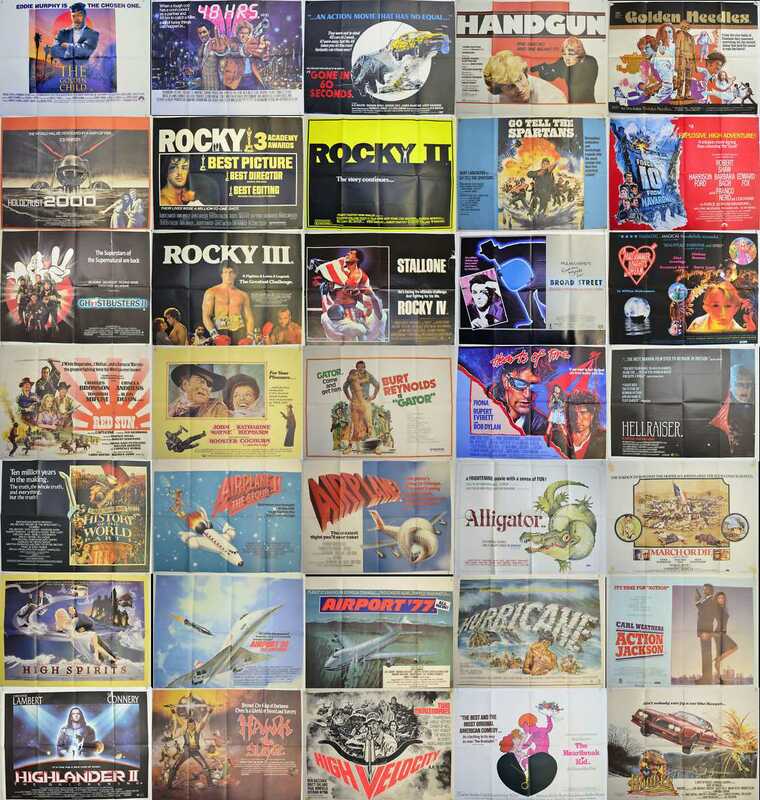 I’ve got some great British Quad Posters up for auction this week, mostly from the 1970’s and 80’s. Top of the bill I have posters for the first four in the “ROCKY” series including a rare teaser for “ROCKY II”. Then for action lovers I have the original “GONE IN 60 SECONDS” from 1974, plus “GOLDEN NEEDLES”, “FORCE 10 FROM NAVARONE” and “GO TELL THE SPARTANS” starring Burt Lancaster. John Wayne and Katherine Hepburn fans might enjoy “ROOSTER COGBURN” from 1975 or perhaps another western Starring Charles Bronson and Ursula Andress “RED SUN”. For Beatles / Paul McCartney collectors I have “GIVE MY REGARDS TO BROAD STREET”, and following the music thread I have “HEARTS OF FIRE” from 1982 which stars Bob Dylan. Plenty of Popular 80’s titles including two from Eddie Murphy “THE GOLDEN CHILD” and “48 HRS”, plus disaster movie’s including “HURRICANE” (Chantrell Art), “AIRPORT ‘77” and “AIRPORT ’80”. Other great titles include “GHOSTBUSTERS II” and “HIGHLANDER II”, and if you want a little restoration project the poster I have for “HELLRAISER” might just be what you are looking for! Click THIS LINK to go directly to all the auction titles.